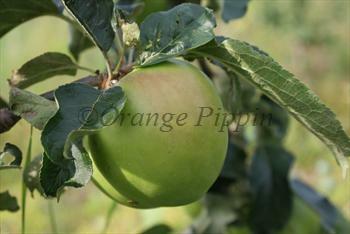 Grenadier is an early season apple, ripening in mid-August in the UK and primarily intended for culinary purposes. It is very easy to grow - almost foolproof in practically any situation. The flesh cooks down to a cream puree, and is ideal for summer cooking and baking. Unlike late season "cookers" such as Bramley, Grenadier apples do not keep particularly well, but they do hang on the tree so picking can take place over an extended period. Please fill in the details below and we will let you know when Grenadier apple trees are back in stock. A modern English cooker, similar uses to Grenadier. Flowers over a long period.? Grenadier is in flowering group 3. Grenadier is partially self-fertile, but fruiting will be improved if there is a compatible tree of a different variety nearby. Since it flowers in the middle of the blossom season it can be pollinated by most other apple trees. The best word to describe Grenadier is reliable. It will grow almost anywhere, and tolerates wet climates better than most apples. It grows in a compact form, making it viable in even small gardens. It is also highly disease resistant - you almost never see a Grenadier tree with any of the usual apple diseases. If you are not sure about growing apple trees, and want an early-season cooking variety, you can't really go wrong with this one. Grenadier produces quite good crops from an early age. It is worth picking off apples that form in the first few years to ensure the tree grows to its full size before encouraging cropping. Once it gets going, Grenadier becomes a very heavy-cropping tree. The apples are quite large and there are lots of them - and you wonder if the branches can take the strain, but they usually seem to just bend down under the weight. Grenadier is also a good pollinator of other varieties, it produces a lot of blossom over a long period. The origins of Grenadier are not known, but it was grown commercially in the UK for a period in the early 20th century.